This is part 2 of the article: Why would God put man and the devil on the same place? In Jewish custom, people who are set forth to be leaders are made to represent an entire group of people. When a father of a family speaks, he is actually speaking for his entire family. It is no different from our democratic custom where a political leader (a mayor or a minister) is known to be ‘the voice of the people’. What they say reflects what the people say and what they do reflects what the entire population does. In the Bible, ‘Federal heads’ act like that of the high priest; their actions represent the actions of mankind. What they do can bless a whole nation(should they please God) or send it to damnation (should they sin). This is what is meant by Romans 11:16 when Paul wrote: “If the first fruits are holy, then the rest are holy. If the root is holy then so are the branches.” When our federal head or high priest is holy then God considers the whole nation as holy BUT when our federal head fails, then God sees the entire nation as a failure. Both Adam and Jesus carry the title ‘son of God’ (Melchizedek, on Hebrews 7, only RESEMBLES the Son of God which makes Him a mere shadow of who would be the greatest of all, Jesus Christ). The rest of humanity came from Adam’s flesh whereas the rest of the saints were re-born in The Spirit of Jesus Christ. Both were federal heads and throughout this article we shall see what each one did that steered the destiny of mankind. The first Adam and the forbidden tree. Adam, the first federal head, committed an act of treason that led to creation’s fall. And because of him and through him, all were made to be sinners (Romans 5:12). What is so wrong about the forbidden tree? Was God simply giving a law for the sake of giving a law? The first Adam was commanded not to partake of the tree of the knowledge of good and evil. 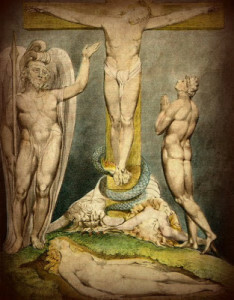 It doesn’t matter who tempted who or who ate the fruit first (Adam blamed the woman and the woman blamed the snake); Adam disobeyed the only commandment God has given him and being the federal head during the time in The Garden, his rejection of God translated to the whole world’s rejection of The Creator. The tree Adam partook from was the tree that brings the knowledge of good and evil. It is the tree that will bring people awareness of what’s right and what’s wrong, it is the tree that will bring accusations and condemnation to mankind. Adam partook of the tree that holds God’s laws; and when there is law, there will be transgressions, when there’s transgression there is accusation and condemnation, and where accusation and condemnation are, there is sin (See opposite Romans 4:15). And there is sin, there will always be death. Adam partook of the fruit that activated God’s laws and therefore bringing forth death to all creation. It is something that God has never planned for any of us (that is why He strictly forbade eating of it). God’s law is holy and perfect (Psalm 19:7), so perfect that only God is worthy to handle it and live. The rest will be made sinners and thus, be punished with death. No flesh can glory in the presence of God, for all have fallen short of His standards. Before the knowledge of good and evil, we were all spared of this reality (Romans 4:15). There was no punishment for there was no sin; there was no sin because we had no knowledge of it. As soon as Adam partook of the fruit of knowledge of good and evil, our conscience came to life and we (creation) died. This actually reminds me of what people were saying about the theory of evolution, that it made God irrelevant; when self-righteous scientists would declare that science ’put God out of a job’. Man sought to rule the world by themselves. We are the greatest creatures on earth, no one is above us. This is what’s in the heart of our flesh. We would always want to believe that man created God. Unfortunately for that time, God is and forever will be an honorable and righteous God. He promised us free will and it’s free will we have. If it’s a world without God’s authority we want, then it’s a world without God’s authority we get. Because of Adam, the first federal head of mankind and his decision to eat of the forbidden fruit, all authority we had on earth has been forfeited to the one he obeyed – the serpent. Without God’s perfect authority, weakness, sickness and death came in our world. Work and slavery came in, and even pain in child birth was introduced. Now the world is experiencing death all around, famine, danger, nakedness, tsunamis, earthquakes, wars, diseases, poverty and all HELL. Are all these God’s doing? Actually, God FORBADE us from eating the fruit so He can rule over us in paradise. It was man who rejected God’s real desire for us and it was man who rebelled against God’s eternal goodness. Who is The Last Adam? The Last Adam will be responsible for making humanity and creation righteous in God’s law. Let’s cut this article short as it is already a couple of weeks overdue. The Last Adam, another federal head of mankind, will bring life-giving spirit to many, He will restore our standing and our relationship to God, He will give us everlasting life. In my study (common sense), there is no other Being in the whole universe who is close to having this job description. I submit to you, the Last Adam is no one else but Jesus Christ. Below are some Biblical references to the Essence of The Tree of Life. The tree of life will bring eternal life to anyone who eats it (Genesis 3:22). Jesus said that He is The Way, The Truth and The Life (John 14:6). If you eat my flesh and drink my blood, you will have eternal life (John 6:54). I am the living bread that came down from heaven. Whoever eats this bread will live forever (John 6:51). From the clues above, I believe that the more appropriate question should be: Who is the Tree of Life? In the beginning, when man was damned by his knowledge of his sins, God hid away the tree of life (Genesis 3:22). Imagine if Adam ate the fruit of the tree of life, we would be in sin’s punishment forever? Now because of the last Adam, Who shed His blood on the cross to clean us off our sin, God won’t have any hesitations giving us this fruit. Jesus Christ didn’t just make us righteous to The Father, through His sacrifice on the cross He made us sons of The Most High God. Being the Tree of Life, Christ has given us eternal life. The result of Jesus Christ: Eternal righteousness, eternal blessings and eternal paradise! The first Adam had everything but in rebellion, he lost everything to the devil. Jesus Christ, The Last Adam, lived in full obedience to The Father that He laid down His life and hung on the cross restoring man’s righteous position from being damned sinners into righteous saints of God. In the times to come, Christ, having restored our righteousness will lay His claim on another thing the first Adam lost, His claim to earth. Next: Who owns the earth?